This past Sunday, I made the first trip of the year to my favorite nursery. The sights and smells of the plants, the benign conversations with horticultural experts/plant lovers did something magical to my mood. I was enervated, optimistic and boy, did I have energy to take on the many tasks on my to-do list. Yes, thats what being amidst all things plant related does for me. This state of elevated spirits beats the ‘induced’ kind any day. It leads to creativity and productivity, spreads good will, no hangover follows and best of all, one remembers everything. And joyfully thus, my gardening season is underway. For instant gratification, I picked up flats of primroses and pansies that will go into assorted urns, pots and window boxes. Now, mind you, as exciting as it is, there are challenges. My garden Open Day is fast approaching ( May 10) and given the severity and length of this past winter, time is short for getting the garden ready and spectacular. But that is not the most serious problem. 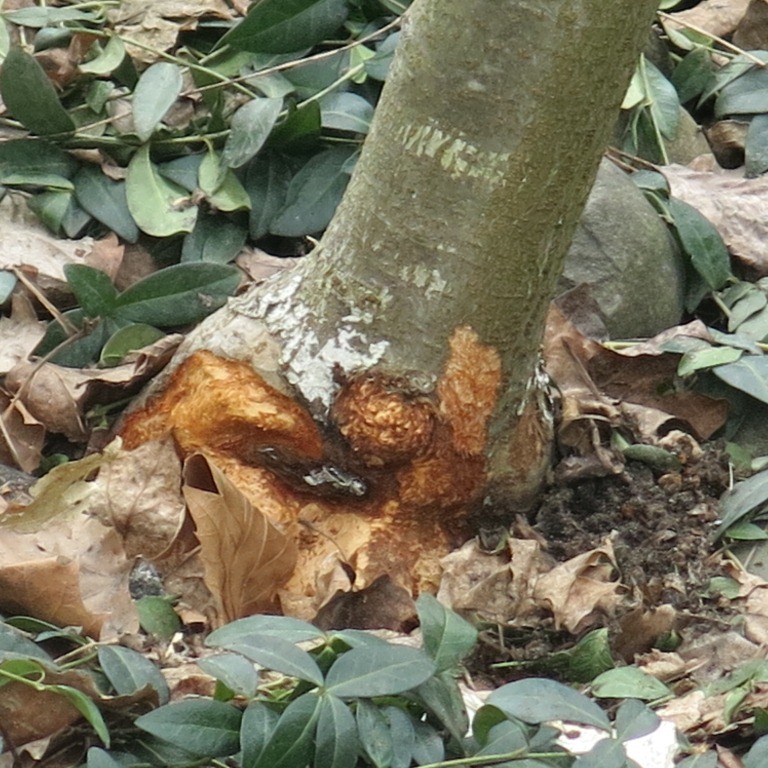 Of grave concern is the fact that orchard mice have attacked several of the apple trees in the espalier fence. How much damage has been wrought is yet to be determined. I can only hope that for the most part, the trees can heal themselves nicely. To replace any tree will not be easy. To remove a tree from within such an espalier arrangement and replant with a healthy tree of appropriate maturity requires some effort. There might well be more than one damaged tree. Oy vay. 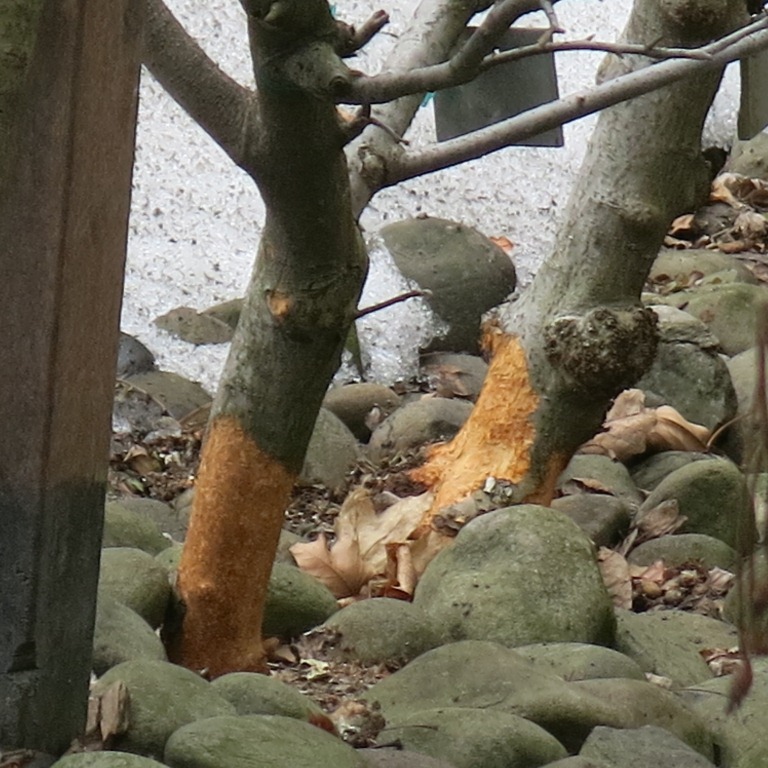 When I first noticed the tell tale signs of orchard mice activity, I was immediately inclined to panic. I had this strong urge to pour poison and decimate the rodents. But thankfully, that feeling lasted just a minute. Okay, five minutes. I breathed deep and let myself relax. Strangely, my next thought was to consider how hard the winter must have been for the mice. The apple trees had not been touched all these years so, they must have been under a fair amount of stress to turn to my precious trees. I even envisioned that some of them were fiercely protective mothers doing whatever they had to for the wellbeing of their young ones. Sigh. How could I remain outraged? Looking at it from another creature’s point of view helped adjust my own perspective. As much of an effort and expense it might be to remedy the problem, the fact is, the situation can still be fixed. Its not the end of the world. Am I happy then? No, my time, energy and pocketbook are not limitless but I’m not unhappy or upset either. I have forgiven the mice, accepted the problem and will now try to correct it the best I can. I will be discussing the matter with an expert so I can find out more about how to deal with it properly. Any insight gained shall of course be shared with all. If anybody has had a similar experience, I’d love to hear about it. This is once again a reminder that we humans are not in charge. Nature is. And I must defer to her. 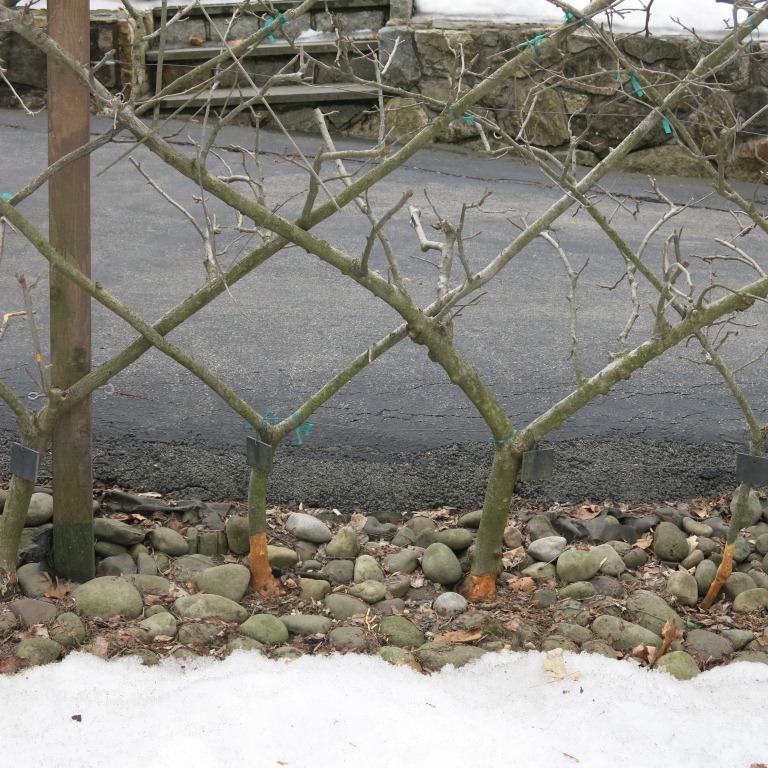 So, with the espalier problem on one hand, I look around the garden to counter-balance the status. The bulbs are piercing through the earth. 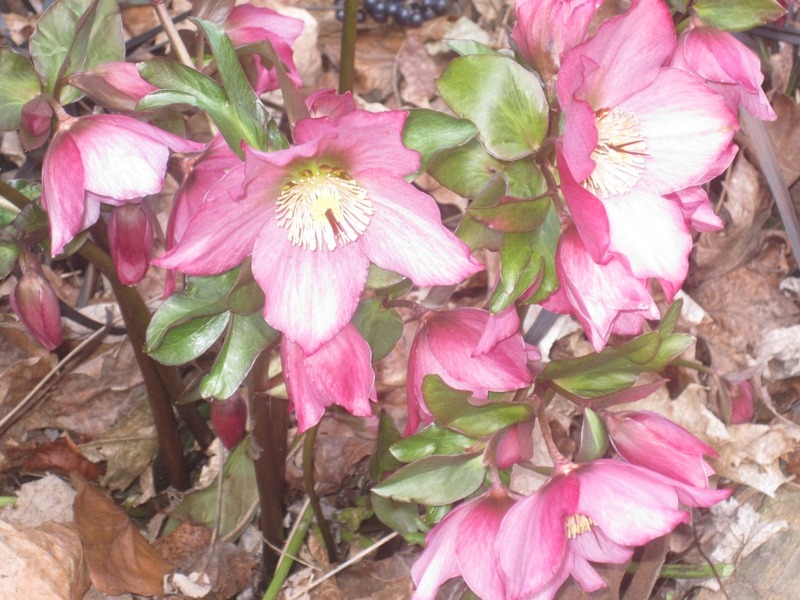 Snowdrops and hellebores are blooming. The boxwoods look a bit winter weary but otherwise seem to have fared okay. And most excitingly, the Amelanchier I said I was going to plant, was purchased and ensconced in its rightful home yesterday. 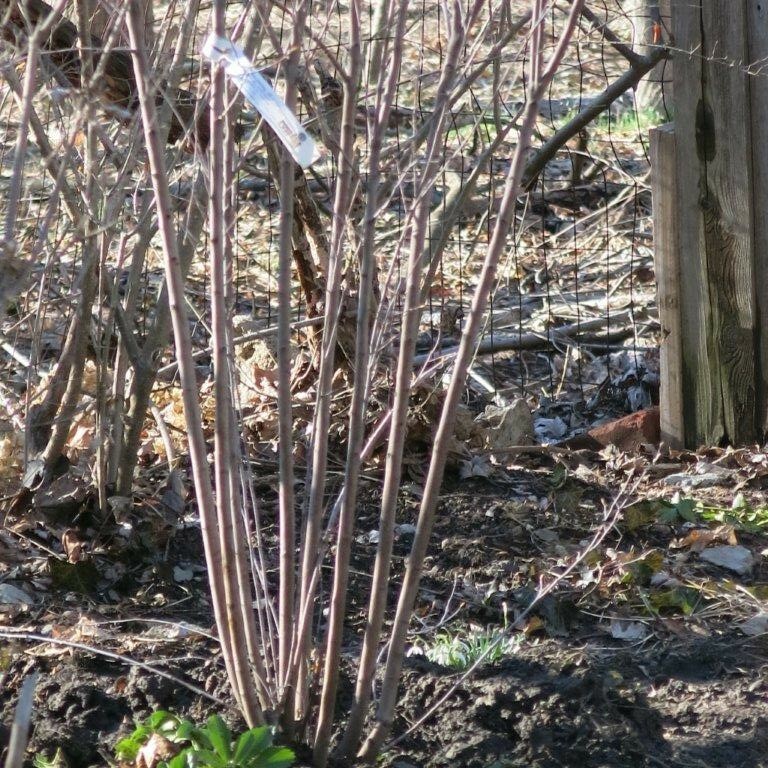 It is A. canadensis ‘Glennform’ – a shrubby type that is full of buds. I cannot wait to see it in bloom. It will lead the eye nicely across the meadow when viewed from the terrace. Once it was in the ground, I welcomed it to my garden, wished it well and promised that I would do right by it. I renewed my covenant with Nature. Many, many chores remain and the garden is yet to reveal fully what plants could not take the winter. This is particularly true of the vertical garden. It is a vulnerable area and we are still learning what works and is needed. Ferns are slow in emerging so it’ll be cutting it very close to May 10 to determine anything. The suspense is killing! As I dive into the season and begin my work, I’m just so excited and grateful to have my own piece of paradise. At the same time, I’m apprehensive about how to make it shine for the visitors in May. I know the ones who are gardeners themselves will understand about those aspects that simply cannot be helped and are due to the vagaries of the weather. But, I also want to please those who do not garden and rightfully come expecting to be delighted and impressed. Their opinions matter as much and I enjoy their comments equally. I’ll just have to work very hard and do my best won’t I? In the end however, whilst looking beautiful, a good garden must also teach. I hope all the visitors leave my garden suitably impressed and a little bit more knowledgeable and enriched. Too often we forget that to have a garden to tend is to be truly blessed. We never really own it. We are but the caretakers and must share it with grace. Let the gardening begin! 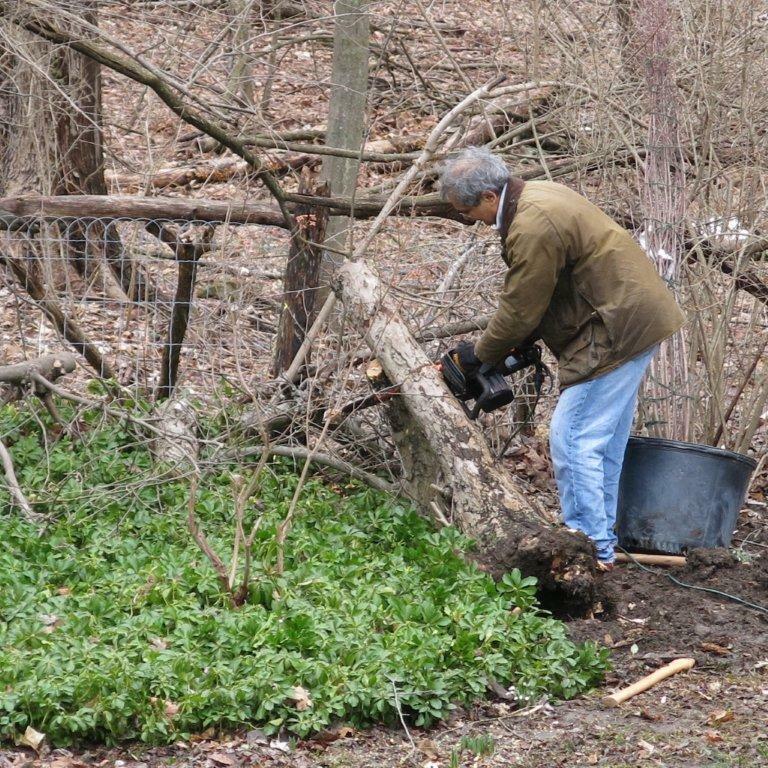 Removing the old, apple tree. This entry was posted in All Gods Creatures, Deep thoughts, Move It, Open Garden Day, Seasons Greetings, Your Garden and the Globe by shobha. Bookmark the permalink. I do hope that your trees survive! I just put the snow shovels away and await seeing what this winter wrought to my plants. My bamboos are brown and I have never seen that. I too hope that they heal and return to their magnificence. Thanks Christina! Please send lots of healing energy this way! AmeN to that title. Love it! Steinbeck would too. It was painful to see what havoc the mice have wrought. Your article puts the problem in perspective. Thanks. You are a much better person than I am. Your thought process of empathizing with and forgiving the field mice was wonderful, and fitting your “covenant with nature.” Love that term. I would have been homicidal. Or mousicidal.